Local and foreign writers are set to gather in Seoul to discuss literature later this month, when the Literature Translation Institute of Korea hosts the Seoul International Writers’ Festival. “As (the institution) focuses on introducing Korean literature to the world, many of its events take place abroad. 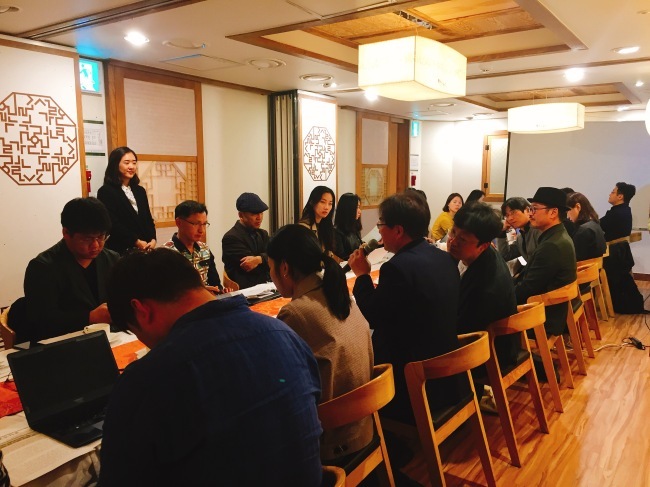 While there aren’t many events hosted in Korea, the Seoul International Writers’ Festival is the most representative one,” Ko Young-il, a representative of the institute, said Monday at a media briefing in central Seoul. “From the planning stage, we worked on inviting young writers, local writers who are not well known internationally and foreign writers who are not very well known in Korea but are expected to lead the global literature scene,” Ko said. Sixteen Korean writers (seven novelists and nine poets) and 14 foreign writers (six novelists and eight poets) will participate in the festivities, which include talks and readings. The free-talking sessions are mainly for professionals in the field of literature. Five sessions exploring the subjects of gender, social disasters, diasporas, individuals and capitalism will be held at independent bookstores across Seoul. Before each event, the writers will look around the neighborhood, sightseeing and experiencing different parts of Seoul. Readings for the general public, especially those with an interest in the featured writers and their works, will take place at Spigen Hall in southern Seoul. To make the events more dynamic, each reading will take the form of a performance. Excerpts of the featured novels will be read as if they were lines from a play, while some of the poems will be sung. “This year’s overall theme, ‘Nowhere / Now Here,’ is a classic task for literature. Literature is an ambivalent work that delves into the present, but also searches for another place and time,” said poet Shim Bo-seon, a member of the festival planning committee. The festival will kick off Oct. 21 at the Garden of Art at the Sejong Center for the Performing Arts in Gwanghwamun, central Seoul, where visitors can meet the writers and learn about their work through various activities. For more information on the Seoul International Writers’ Festival, visit www.siwf.or.kr.